Coleman first conceived the idea of a lamp specially designed for reading in 1907, and it took two years to put it to fruition. The result was the Model R, and its height allowed it to illuminate the pages of a reader's favorite Mark Twain novel. The lamp is fueled by gasoline and pressured with an external hand pump; the unit took several seconds to light. Manufactured for seven years, fewer than 20,000 Model Rs were shipped, and the glass shade has become especially rare. This is an original shade, and the lamp was made circa 1910. This is a Coleman Air-O-Lite lamp, but it's missing its nickel plating. A previous owner stripped the plating to reveal the brass material underneath. The shade is a NuLite #4, which retailed for $15 in 1919. The lamp is presumably from 1912. It has a single burner that produces 300 candlepower and a tank that holds a half-gallon of gasoline. The Model N Air-O-Lite lamp was a follow-up to the Model A in 1916, sold concurrently. It too has 300 candlepower and holds a half-gallon of gasoline, but has a much different fount, which is smaller and rounder. This Model N is equipped with an American Gas Machine 5185D-36 shade. This lamp is mysterious, but it appears to be similar to a lamp originally made by the Yale Light Co., a company which Coleman bought out. Terry Marsh indicates that the base is virtually identical to those manufactured by Yale before the buyout, and since it isn't labeled and the burner resembles that of a Quick-Lite, it is presumed to be a Coleman-era lamp. Few details about the specifics of this lamp are known, but it is presumed to be from 1916 to 1920. It is unknown if the base and burner originally went together. This lamp also includes a shade (not pictured). W.C. Coleman was never satisfied with the Air-O-Lite lamps because they didn't light quickly enough. In 1913, one of his engineers lengthened the generator and tried rubbing two wooden matches against each other. This produced what W.C. wanted, so he green-lit the project. When released in 1916, the Quick-Lite was a sensation, and the main line eventually sold over two million units. Coleman quickly improved the Quick-Lite lamp, releasing model CQ in 1917. This CQ lamp from 1920 features 300 candlepower and is equipped with a half-frosted glass globe. The rarest part of this unit is the 462 porcelain globe fitter with the tall antenna. Today, the fitter is worth well over the price of the lamp itself. First made in 1932, it is unknown how many were made or for how long. This Coleman CQ lamp (date unknown) was put to unique use in our garage. This custom piece of art is a takeoff from a similar-looking lamp in the classic movie A Christmas Story. It measures about four feet tall and welcomes guests to the store on a daily basis. In 1924, Coleman rebranded the Quick-Lite CQ into the Model C, which had virtually no differences from the CQ. This lamp is equipped with a 335D shade. This BriteLite #66 lamp has been "Colemanized" - its original burner replaced with one made by Coleman. This is a QuickLite burner from the 1920s, presumably a C like the one above. It is unclear where the shade came from. This Quick-Lite lamp was made by Coleman Canada using the technology developed in Wichita. It was the first such lamp developed in Canada, presumably in the 1920s. Note the pattern around the base of the handle - if it's Coleman, it is indicative of a Canadian-made lamp. This unit is fitted with a standard opal 307 shade that is original for the lamp. This bracket lamp is similar to Quick-Lite table lamps, only designed to be hung on a wall; due to this, it could only hold 3 pints of gasoline. First introduced in 1916, the BQ bracket lamp series eventually shipped upwards of 47,000 lamps, including this one in 1925. This is equipped with a 321 glass shade, which is designed to deter insects from entering the mantle. Coleman continued making these lamps until the Great Depression made it unfeasible to do so, and they never returned to the bracket lamp business once the economy improved. The Deluxe Parlor (left) and Deluxe Aristocrat (below) lamps were unique lamps developed by Coleman in the 1920s. Records are unclear of how much of each were shipped, or how Coleman distinguished between the two in Hiram Strong's absence. Most Coleman experts today estimate that only about 720 of the Parlor lamp were shipped, due to the fact that very few in existence are known. This one, restored to its original glory, and is presumed to be from 1923 or 1924, when the majority of these were shipped. They were not popular, as they were heavy, bulky, and had an 1890s style with matching amber shade. The vase was a single piece, and although stylish, most people found the lamp dated and expensive for the time. The Deluxe Parlor (above) and Deluxe Aristocrat (left) lamps were unique lamps developed by Coleman in the 1920s. The Aristocrat, also called the "Deluxe Quick-Lite" to indicate improvements upon the Parlor lamp, is shrouded in mystery. It is more common than its sister, and presumably came after. Due to Hiram Strong being in Toronto, it is unknown how many of these were shipped or when, but it was between 1925 and 1932. The bronze finish is the same as the Parlor Lamp, but it has a lighter two piece-vase, which may have made it slightly more popular. Theories, including from the late Herb Ebendorf, suggest these vases may have been designed by Coleman's Edward Miller subsidiary in Connecticut, the company which first produced the rare Efficient Lamp. Coleman Canada invested in the Everbright company, based in Toronto, and both Coleman U.S.A. and Coleman Canada continued producing lamps under that name for some time. This one was sold through Sears in the early 1930s, and did not sell well due to the Depression and was subsequently discontinued. This is a later Arcolite model still made by Coleman for Yale. It is undated, but is presumed to be from the early 1930s. This also uses Coleman's Instant-Lite technology, a match-lighting of atomized fuel. Lamps like this fulfilled W.C. Coleman's dream of being able to create a gas-powered lamp that lit as quickly as a light bulb. This lamp comes with a common 307O shade, which is original. 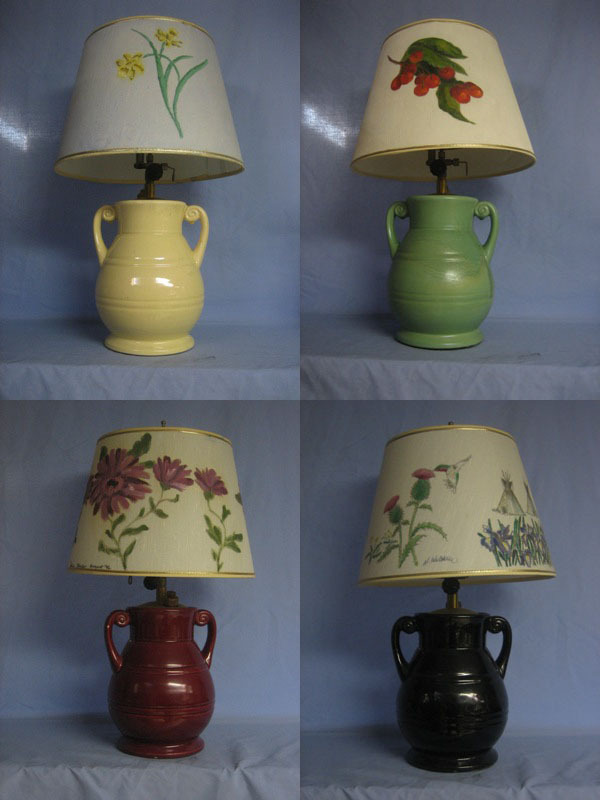 The 150 Pot Lamp, sold in the late 1930s and early 1940s, came in four different colors (clockwise from top): ivory, spring green, black, and wine red. Dubbed the "New Deluxe" by Coleman, these succeeded the long-forgotten Deluxe lamps from the 20s. The vases are pottery and contain a one-quart fuel tank. These instant-lighting lamps have two mantles which produce 300 candlepower in total and are outfitted with mica globes. The original parchment shades have deteriorated, and have been replaced by shades customized by Wisconsin artists: Mary Bruno (ivory), Nancy Barth (green), Harry Whitehorse (black), and Leslie Straka (red). This is one of Coleman's largest lamps, produced from 1937 to 1942. At 3 mantles that produce a whopping 450 candlepower, the 151 lamp came in either this black or a spring green. The fount only could hold up to 4 pints, which could light an entire room for 12 to 14 hours. The parchment shade conceals a Pyrex globe but is not the original, which was more decorative. This Model 143 Instant-Lite lamp was made in October 1939. The parchment shade is original with a Poinsettia pattern and a decorative cord, and covers a Pyrex globe. This lamp appears to have a separate pump, which is not with the unit. Some Coleman collectors take it upon themselves to ponder creative ways of self-expression, and turn it into art; this unit was created by such a creationist and sold on eBay, and it wound up here. The base is a 139 lamp from 1941, and instead of a shade, a 220 lantern has been fitted to make this a very unique lamp. This lamp came with a compressed air kit, which helps it ignite. It is a usable lamp even with its artistic nature. The 157 lamp was made in both the U.S. and Canada in the late 1940s. The lamps were virtually identical in both countries, but the location of the gas cap was different, and some areas of the fount were brushed gold in different places; their color and shades were also slightly different. The shade here is original and covers the Pyrex globe, and the fount has a built-in pump. This lamp is dated February 1948. After establishing success in the gas pressure lamp market, Coleman decided to branch out to kerosene, which was cheaper and less dangerous. First released in 1913, the Ker-O-Lite lamp was their answer. It was simply an Air-O-Lite lamp that had a kerosene burner - two mantles as opposed to one. The lamp was a success, and Coleman continued to make more Ker-O-Lite models. This one, Model No. 160 from the early 1940s, has a single glass chimney which can be topped by a parchment shade. The base is ivory with gold trim, and the tank is in the center of the lamp. One of the three lamps in this collection includes an original parchment shade - worn, but hardly damaged. Another of the lamps comes with its original packaging (pictured). Special Thanks to Terry Marsh for providing information for us!